A car accident can leave drivers or passengers with serious injuries, some of which may not fully heal for months or years. Even a low speed accident can result in a trip to the hospital, especially in head-on or T-bone collisions. 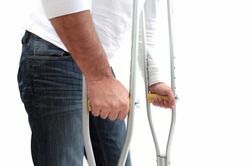 Broken and fractured bones are therefore a common injury among those involved in accidents, leading to pain, frustration, and costly medical bills. If you have been involved in an accident that was not your fault, you should not have to suffer any undue consequences. By consulting knowledgeable auto accident attorneys, you can be compensated for your injuries as well as other damages from the accident. Please refer to the information below, as provided by our Brooklyn law office, on the relationship between auto accidents and broken bones. When it comes to an auto accident, any number of injuries may be sustained: contusions, dislocations, head trauma, and even chemical burns from airbags are possible. Broken bones are another common result of car accidents, often occurring in the legs, arms, ribs, and vertebrae. In a compound fracture, the bone breaks through the skin, leading to possible infection or other complications. Comminuted fractures are similarly dangerous, as multiple breaks occur, leading to difficult reattachment and prolonged healing. Even hairline fractures, which often go unnoticed due to their small size and limited pain, could add up to additional complications over time. Some of the most dangerous injuries, however, are those located within the spine. Under sudden trauma, vertebrae risk getting dislocated, broken, bent, or rotated; in more serious spinal injuries, victims may permanently lose the use of their lower or upper body. Serious injury often results in hefty medical expenses. Initially, a person may have to pay ambulance and hospital bills, alongside any expenses from the doctor and tests that must be completed. Broken bones also tend to require long-term care, including multiple visits to the doctor, medication, and possible physical therapy. If the victim is employed, there is a good chance that he or she will also miss days from work, causing a loss of income. More severe injuries can even result in permanent job loss if the person is no longer able to perform necessary physical tasks. Overall, the cost of broken bones can be remarkably high, giving victims an incentive to be fully compensated by the negligent party. If you have suffered from breaks or fractures from an auto accident, an experienced attorney can help you gain fair compensation. By contacting our firm soon after the crash, we can help you collect multiple forms of evidence to bolster your case. In many instances, the injuries themselves are good evidence regarding what transpired during the crash and what resulted from it. By taking photos of your injuries and gaining copies of your medical records, we can prove that your injuries are a direct result of someone else’s negligent driving. In addition, we will speak with eyewitnesses of the accident, examine police reports, document damage from the crash, and work with experts to reconstruct exactly what happened leading up to the accident. By successfully proving your innocence in the crash, we can help ensure that your medical bills are paid for, along with any similar damages that resulted from the accident. This can include vehicular damage, property damage, pain and suffering, lost wages, and future medical expenses. It’s best to speak with a personal injury attorney right after your accident, as this allows us to gather evidence and speak with all relevant parties as soon as possible. With accurate and timely information, we can give you the best chances of a successful case. Contact us to inquire further or to meet regarding your recent accident.